Directed by Kevin Costner. Written by Eric Roth and Brian Helgeland (based on the novel by David Brin). 1997. Running time: 177 minutes. Pity poor Warner Bros. It isn't going too well with this venerable old Hollywood studio that once gave us classics such as A Clockwork Orange, The Exorcist, Blade Runner and countless others. You see, the rot started last year when the fourth Batman film, Batman & Robin just plain didn't do as well at the box office as they had hoped for. Actually, with the usual media blitz, a strong franchise name and so forth, Batman & Robin didn't fare too badly (that is, financially). Or it would have had the film been cheaper - but a huge chunk of it went to the ensemble cast or rather mostly Arnold Schwarzenegger. Things got worse later during the year when Kevin Costner's latest effort, The Postman, tanked like nothing else before it ever did. Costing a minor fortune to make, the film did lousy business. To worsen things, Warner Bros.'s share of the 1998 summer season was limited to The Avengers and Lethal Weapon 4. The Avengers did badly. Lethal Weapon 4 did good business, but the film was rushed into production quickly when the studio realised that it needed a hit - quickly! Or rather, don't pity them. Batman & Robin was terrible. So was The Postman. Ditto for The Avengers. But still the mystery remains: how could Warner Bros. splash such a huge amount of money on The Postman? The signs were all there: after Waterworld (an expensive film about a post-apocalyptic society on water starring Kevin Costner) how could they make The Postman - an expensive film about a post-apocalyptic society on dry land starring Kevin Costner? Why Warner bros. wanted the film made is a mystery - but the even bigger mystery is why Costner even bothered. In interviews he admitted to being a fan of the book, but if that is the case, then why did he massacre it brutally? A few months after having seen the film, I got Brin's novel as a birthday present. I've never read it before and after having seen the film I was curious as to why fans of the novel hated the movie (along with everybody else) so much. It wasn't because The Postman was a good film - everything but that. I was just curious in the same way I read Heinlein's Starship Troopers after seeing the movie version. Like the Starship Troopers movie, the film version of The Postman should have come out with an "any similarities between this film and its source material are purely coincidental" disclaimer. Brin's novel is set in the aftermath of a minor World War. A lone drifter named Gordon comes across the remains of a postal worker in a truck loaded with undelivered mail. Gordon takes the uniform and mailbag, invents a story about a "Restored United States" and thus scams several settlements into accepting him as the real thing - a postman on his appointed rounds. In the process he inspires other people not only in believing that civilisation can be restored again but also to establish courier services of their own. Only problem is the Holnists - fanatical survivalists who are followers of a (now dead) right-wing nutcase named Nathan Holn. The Holnists are led by ex-special combat troops who were genetically "augmented" to become superpowered soldiers. On his travels he comes across a small community that managed not only to save the last artificial intelligence" supercomputer (named Cyclops). The book ends with Gordon suffering a crisis of faith - was liberal democracy as practised under the old pre-apocalypse United States the genuine item or was it all a scam as the Holnists claim? Are all his efforts to resurrect civilisation as we knew it worth the effort? The Postman is a flawed novel. Some of Brin's ideas don't gel completely. Ambitiously it draws analogues with Lysistrata (the ancient Greek play by Aristophanes about the women of Athens withholding sexual favours until their men stop a senseless war) and the Wizard of Oz who used trickery to "rule" the people of Oz. However, after reading the book I have only one question: had Kevin Costner read it at all? Augmented supersoldiers? Artificially intelligent supercomputers? None of this featured in Costner's film version. In fact, except for its basic premise, The Postman film was stripped of all the sci-fi elements in the book. Not to mention entire storylines, hordes of characters, etc. 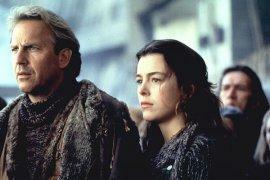 Instead Costner choose to make a post-apocalyptic Western - a sort of Dances With Wolves meets Waterworld. In the process he retread familiar ground - the charismatic loner in the wilderness pitted against the formidable enemy to save us all in the end. Only problem is that we've seen all this before and it wasn't even that good the first time around. Costner's The Postman was a sprawling epic - the sort he likes so much (another example is his Wyatt Earp western) - unevenly paced, too long for its own good, narcissistic, overly sentimental, clumsy. One critic rightly pointed out that at heart The Postman wants to be The Sound of Music (a film preferred to Universal Soldier by Holnist slaves during one scene). Stripped of the novel's complexities, the film gave us Hollywood cliché instead. But this isn't the first time that Hollywood turned an original sci-fi work into a piece of Hollywood hokum and unfortunately it wouldn't be the last. You see, Warner Bros. 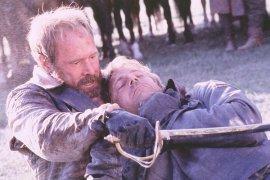 Probably figured that we all wanted see Dances With Wolves again. We didn't - we wanted a film version of David Brin's The Postman . . .